Q: Any memorable off-field stuff worthy of repeating? Q: Can you give me more info about Carp and Moose and the roles they played for the coaches? CS: Yeah, I got to spend a lot of time with them later in my career. Earlier in my career Bryan Carpenter helped out with coaching a little bit sometimes, and he got to coach me a little bit, worked with him in some summer camps. And later in ’96 when I was helping out in the recruiting office and the film office I got to spend some time with Moose and Carp. Great guys. They knew the game, that’s what helped them as a film crew. They had played there, they knew the game, they each knew what they wanted on each side of the ball. Carp was the offensive film guy and Moose was the film guy for Charlie McBride and the defense. They knew what the coaches wanted, they knew what to look for. They cut up the films appropriately, and that was a pretty big deal. I mean, when you get these films in in real time and you’re preparing for the next game it’s obviously a time crunch, and they need to be dissected and chopped down and spliced. And these two guys, (Bryan) Carp (Carpenter) and (Brian) Moose (Mohnsen)? Because they had played the game and knew the coaches and they’d played for the coaches they weren’t just a couple of film guys who came in. They knew the game and I think that sped up that process, Paul, at least two-fold. They were guys who could just help out administratively: summer camps, you name it. They filled needs and were a great film crew. How many guys have been a film guy for a while and now they’re a Division 1 assistant? That says something about Moose, there. Q: I’m thinking that must have been a great education from both scheme and talent evaluation standpoints? CS: Oh sure. And quite frankly, we all wanted to be full-time assistants there. There’s only so many slots, but those two could have been full-time assistants. Bryan Carpenter knew the game, he was an excellent fullback himself, a Kansas guy himself. They loved to ride motorcycles together and they were a big part of the social aspect, too, keeping things loose. They were an integral part. I spent a lot of time back there as a GA, film and how it was cut up, and it was interesting to see the new technology we got in. That was something, too, the new film breakdown machines, how the technology really revolutionized during those ten years, how we used computers to splice all the film. Then DVD’s became a part of it. It was pretty amazing. Q: Now, correct me if I’m wrong, but did the NCAA put some limits on what we could do with the film portion of the game? CS: I don’t know if they did on the film end of it. What’s funny is the coaching staff size -as far as what could be designated as coaches and what could be designated as recruiters- really shrunk during that decade. When I arrived in’ 91, Carp was kind of being a coach and Gerry Gdowski was helping out, and they had a coaching staff of like 15 to 20 guys. And by the time I left, it was just the full-timers and me and Jon and some student assistants. But it was just 12 adults and that was it. You had 12 adults responsible for 150 guys. Q: Who else was with you as a student assistant then? CS: We had Chad Young, he was a defensive back from Omaha. Damon Schmadeke, Merritt Nelson from Fremont, they were some of the guys that were student assistants along with me. CS: Yeah, what a special human being in my life. I mean, we were a couple of kids grew up in rural Kansas areas and liked to fish and hunt and had that in common. Just kind of went through a lot together as roommates. Especially that first year as college freshmen do: all the anxieties and fears and changes going on in your life, and we got to share those. And you know Brook had lost his father when he was young, and we used to stay up late and talk about that. My family, when the Berringers weren’t around, kind of took him under their wing a bit. When they weren’t around, I took Brook home for Easter one time. He was a tremendous person, he taught me a lot. We were really close and had tons of things in common coming from Kansas. It was a heartbreaker, because in college he was my best friend, no doubt about it. He lived life to the fullest, because he was always on the go doing things. He was a pilot, he liked to hunt and fish, he was great in the community going to schools and such, talking to kids. He was a competitor and he was a great teammate to everybody. Most schools? If he’d have gone to a Kansas or Kansas State he would’ve started for three years. 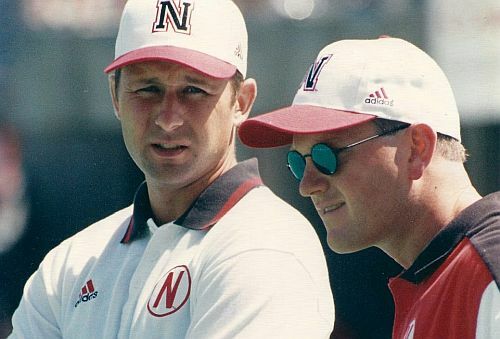 He didn’t get to play a whole lot, and he backed up a legend, Tommie Frazier, during his tenure there. But he stuck with it and he really… the type of quarterback he was? Probably, to be honest with you he would have fit another system better -but he was mobile enough to do Tom’s offense, no doubt about it. Great thrower, very accurate passer, strong arm, a Tom Brady-type. He was gonna be a third- or fourth-round pick. He was so skinny when he pulled up as a freshman. He pulled up in a Mustang, and Brook always drove in such a hurry, like his hair was on fire. (laughs) He was late to the first dorm meeting, he slid up sideways going 70 coming in from the I-80. He was 190 then and by the time he left he was 230 lbs. He was a man. But a good student, a smart guy. He was gonna be a pilot someday, and as the outpouring of grief and support showed, he kind of epitomized what was good about Midwestern life and character and hard work and what a Nebraska football player should represent, down to its core. Not just football, but off the field, as well, being a good student and all. He was kind of like Clark Kent back then. He was larger than life. Q: You know what’s funny, Chad? A few years after the accident I’m sitting on a cross-country flight and I notice this gal on the asile seat is looking at me kind of oddly. I’m wearing my ’95 National Championship ring at the time and she says to me, “I’ve seen that ring before.” And I said, ‘Really? Are you sure?’ (Because at the time I was flying out of San Diego and on to Dallas) And she said, “Yeah, you went to Nebraska.” Surprised, I replied to her, ‘How’d you know that? 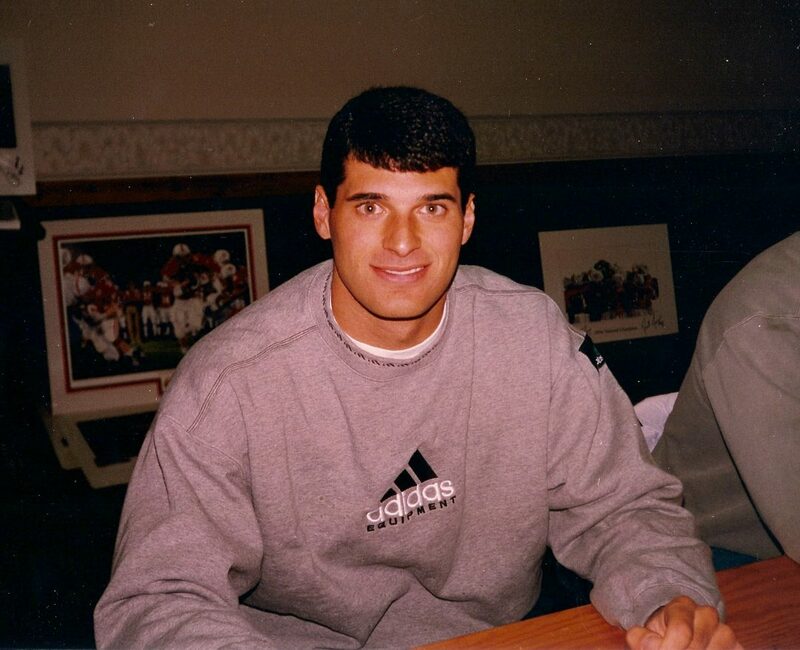 !’ And she said, “I’m Brook Berringer’s sister.” It was Nicole, I believe, and she had this beautiful little baby girl next to her in the middle seat between us. And she said, “Her name is Brooke.” I almost cried a tear when I heard it, seeing that beautiful little girl with the same name. It was touching. CS: It really reverberated around college football for a while. He was really popular among the College Game Day crew when they came around. And we all became really good friends with Mark Miller and Sawyer Brown and they wrote a song about it and it was really a legendary deal. And Paul, his death, because he was such a person of faith? We’d heard about the outpouring of people who were re-evaluating their lives. (Because Husker football can kind of become a religion in and of itself.) It made a lot of people look back and realize there’s more to life than this. Q: But a great life, nonetheless. And I’m not sure if you’ve heard the story, but Kyle Orton, the old Purdue quarterback who played for the Bears and the Broncos and KC, I guess he wore number 18 because he was such a huge fan of Brook. Did you know that? CS: Yeah, I was thinking about that when he went to the Broncos. It’s kind of neat in a way, it’s almost like it was Brook out there. Q: What about anyone else behind the scenes who you feel had a big influence on the teams of those years, who’ve never gotten their due? CS: I know one guy who needs some due: it’s Jack Stark. Not a lot of people back then had a sports psychologist. It’s kind of touchy-feely to what you’d consider warrior-men. When they started that Unity Council and I got there in ’91, there was actually some racial tensions on the field. It wasn’t bad, but it wasn’t good. It wasn’t positive toward the chemistry of the team, but once they started that Unity Council and Jack counseled these players? This was about the time we started seeing a lot of guys from some broken homes and some bad backgrounds and didn’t have any family, and Jack kind of took them under his wing and counseled them through college and talked them through their problems. And we could go to him about anything. He deserves a lot of credit during that run, and in fact I became close to Jack and served on the Unity Council and helped ramp that up when I was the GA. That was really neat, and Jack knew enough about sports, had been around enough sports -and not to paint all psychologists with a broad brush- but he wasn’t the typical psychologist. He ‘got’ the athlete, and could deal with that ego and bring ‘em down to real people. He’s a special guy that the fans may not remember. And of course, the strength guys: Bryan Bailey and Randy Gobel and you? Great people, great technicians. We were taught the right technique, and we didn’t know we were pushed. But you guys were real, too. It wasn’t like Sports Illustrated portrayed us: just some factory. And even though there were broad strokes to the program, it was individualized, too. I didn’t have the same workout as Jason Peter. It was unique. Q: If you could pin something down that you’re most proud of during your time there, what would it be? CS: Probably the thing I’m most proud of is just being there a decade, a part of something so special, so unique. Championships and making so many friends and gaining so much knowledge, getting a couple degrees out of there, Paul, a Bachelors Degree and a Masters Degree. I always wanted to walk out those big red doors… it’s different now, but remember those big red doors at South Stadium? Well, I always said, ‘When I walk out of those doors for the final time, I want to do it with my head high and say, ‘I did it all, accomplished all I could.’’ And I wasn’t a great ballplayer or anything, but I feel like I maximized my opportunity there as a player and being on Coach Osborne’s last staff. That was a special thing. 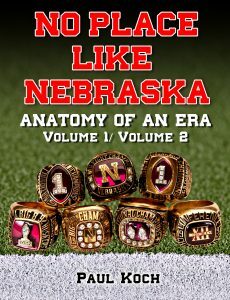 And the main thing is that you can call a guy like Tom Osborne your friend, now. He was a legend that first meeting and, in the end when you walk out the doors, he’s your friend. Q: Your last game coaching there? CS: That would have been against Tennessee in the 2000 Fiesta Bowl after the ’99 season. And Ryan Held and I were on opposite sides, because he was at Tennessee then. And we could see each other. During the game he was one box over, so we could see each other during the game. And we had a bet: at the end of the game the other one would come out of the box and give the other his fitted cap. I thought, ‘Your cap’s cool.’ (He had a fitted Tennessee cap.) And he never said a word after the game: He had John Chavis behind him and the other coaches coming out of their press box -they weren’t too happy- and he just reached out his cap and gave it right to me. (laughs) So I got his brand new, fitted bowl cap. I still have it, from the 2000 Fiesta Bowl. Q: And then where’d you go? CS: Well, 2000 I was around there that next season. They indicated there may be an opening for me, so I hung around and helped run the recruiting department, breaking down film, doing some administrative things, help with Pat Logsdon, helped organized the recruiting girls who showed the families around, I worked with them. CS: Yeah, what a tough job. And then Ryan Held got a job at Peru State, and that’s when I started to see the friction between the athletic department: of course that would have been Steve and Coach Solich. And when the AD and your head coach don’t get along and you’re the youngest guy on the staff? When the music stops you’re not gonna have a chair to sit on? I could kind of see the crack in the foundation even though there were a couple of seasons before all that happened. But I didn’t want to be without a job, so I went with Ryan and we had a great time coaching at Peru State. CS: I know. And it’s funny, being 36 years old I recently got together with a local high school staff on the greaseboard putting some defenses up, and all those mentoring sessions from Osborne and the coaches -the Tenopirs, the Browns, the Gills, McBrides- all come back to you. You can share this knowledge and it’s applicable to you today. You can help win football games. It will be eternal, as far as football knowledge. I always tell people there was nothing special about me, I was just a sponge for a decade. I just soaked it all up and I can complete a sentence and I can transfer knowledge. And that’s what I’m doing with the young kids again. Q: Is there one overriding philosophy that you carry with you from those days? I feel that Nebraska football taught you real life. It was toughness. It was ‘only the best survive.’ I think you can still do that today with kids, they need that more than ever. I just feel like our society, especially young men, it’s soft. They’ve only grown up with affluence. And with the world changing it’s a perfect time to teach some of these young men the values that I learned at Nebraska. And I’ve got to say, Paul, it’s been great taking a walk down memory lane. I could do this for hours…. If only I had more hours with each and every one of these people, it still would never be enough. 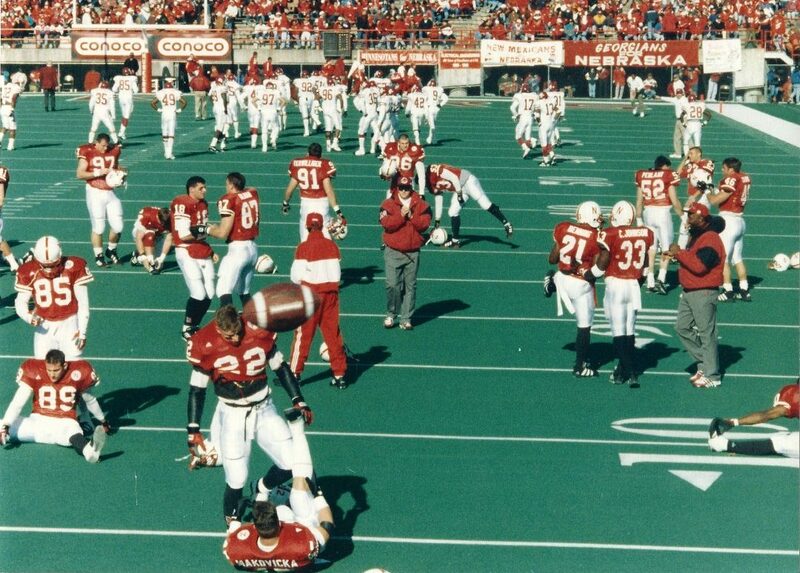 This far into our journey it’s really hitting home to me that the Scarlet Brotherhood will only die when they do, and that what we had there in the bowels of Memorial Stadium will live on well after our souls are loosed for the heavenly realm (His second-coming notwithstanding). Also, I’ve arrived at a place of belief that I no longer see myself as less than adequate for this task, because my long-standing relationship with these people has enabled a comfortable ease of conversation and trust, allowing them to reveal more of themselves and their experiences than they might normally would a stranger piecing this chronicle together. Due to this fact, you are truly getting at the heart and the emotion of the subject, unplugged and unfiltered. In the same vein, I hope you that also feel as if you’re getting the straight stuff and not some buttered-up, built-up or puffed up load of contrived nostalgia. Remember when I mentioned authenticity at our journey’s start? It still holds true, and I hope you find great comfort in this fact. There was so much to digest from this conversation, but I’ll highlight a few subjects that I feel are most key. One was Chad’s mentioning of the technology and rather craftsman-like use of it, “They cut up the films appropriately, and that was a pretty big deal… these two guys, Carp and Moose… they knew the game and I think that sped up that process… at least two-fold.” Call me a tech-dweeb, but the use of digital video played an enormous role in allowing an already accomplished coaching staff hum along at warp speed while everyone else in their field was crawling with film projectors in dark rooms. This makes me want to add Bryan Carpenter and Brian Mohnsen to my list of must-have interviews. I’ll have to seek them out and track them down, somehow, for I think they have a story or two to tell about the part technology played. The other piece that stood out was his lumping all of the little things together and linking them into the achievement-oriented culture of the time, “Just all the fringe things, they all played a part in creating a championship atmosphere. It wasn’t just football. We wanted to have the most Academic All-Americans, we wanted to set strength records. It was constantly creating a Culture of Achievers.” Think about that for a second. Remember how Ryan Held previously mentioned that practicing mid-week at full-tilt led to success because one can’t just ‘turn it on’ on game day? Well, I think the same applied to all aspects of the program, now that Chad mentioned it, because it fostered a constant, never-ending loop of improving efforts, of dispelling contentment, of continuing to reach for the highest rungs in life’s ladder. In this spirit, I believe former UNL philosophy professor Hartley Burr Alexander hit it right on the head when he penned Southwest Memorial Stadium’s cryptic and infamous verse: “Not the Victory but the action: Not the goal but the game: In the deed the glory.” Glory be!